In preparation, we invited a broad range of members, geographically and ideologically, including a few identified with the main contending tendencies at the convention. All the responses we received are included. We edited out duplicate mentions of two controversies: the vote to endorse the Boycott, Divest and Sanction campaign, and the vote to disaffiliate from the Socialist International. We have also excised comments about another controversy that broke out after the convention. A newly elected member of the National Political Committee has been targeted after-the-fact - and also defended - by members and others, when it was noted that his candidate’s statement did not mention work as an organizer for a police union affiliated with CWA in Texas years ago. This has created a firestorm online, and Portside intends to cover it in due time. We do not want to further inflame the debate at a particularly sensitive time for DSA. We previously ran an extensive, exclusive report by NYC DSAer Heidi Chua. Jim Williams (South Sound in Tacoma): The 2017 convention of DSA was a real hum-dinger: 750 delegates were representing over 25,000 members. DSA is now the largest socialist organization since the CP in the 1940s. Many of you have now seen reports that indicate that this is no longer your father's DSA. It supported BDS against Israeli Apartheid. It left the Socialist International. It called for the abolition of prisons and many other motions that may have Michael Harrington spinning in his grave. The crowd was overwhelmingly young. Most delegates had been members for only a few years – mostly drawn by the Bernie Sanders campaign. Interestingly, their mood was to go far beyond Bernie's modest social democratic programs to more advanced socialism. I think CCDS members, with their experience and understanding, could contribute a lot to this new DSA. The DSA convention did not do much on international questions beyond its support of BDS and its withdrawal from the Socialist International. However, there were speakers from Spain's PODEMOS, Portugal's LEFT BLOC, Jean-Luc Mélenchon's LA FRANCE INSOUMISE, and Jeremy Corbyn’s MOMENTUM faction within the UK Labour Party. All of which gives an idea of DSA's orientation to international issues and alliances. Sarah Mills (New York City): As a newer member of DSA – although I predate the post-election contingent by three whole months, making me practically a veteran – the 2017 Convention was my first, as it was for many others. The theme of “25,000 members” was predominant – I believe there may have been a requirement that every proposed resolution reference DSA’s “massive growth” in its preamble. Having spent the previous two months engaged in internal chapter conversations about not only the merits of the resolutions but the anticipated opposition, there were a few standout highlights – namely, the fact that we managed to leave the Socialist International and endorse BDS with only 20 minutes of debate apiece. Similarly, I am incredibly proud that the Afrosocialist and POC Caucus proposal passed with zero speakers in opposition. Because massive growth poses challenges, I was pleased to see that a proposal for official grievance procedures at both the national and chapter level passed handily. Additionally, as an opponent of mandatory monthly dues (which the propagators of the proposal repeatedly stressed were not mandatory), I thought the membership made a solid decision to vote down a Constitutional amendment to that effect, in favor of a more lenient resolution. One of my favorite passed resolutions called for a national training program that would send seasoned organizers to train newer, smaller chapters – which will be key in Republican states where DSA has the capacity to launch serious opposition to tea party politics. This training program is deliberately designed to facilitate the exchange of information between newer and more established chapters, so it is not a top-down system. The trainings will evolve, incorporating lessons about strategy from younger and more isolated chapters, and will create more trainers to go forth and run their own regional trainings as new locals continue to form all over the country. Some of these trainings were on display during the convention as well. I had the pleasure of running an Organizing 101 module with fantastic people from all over the country, as well as a 103 training on the “Member Mobilizer” program which was designed by members from my own branch. The mobilizer program is a way of organizing internally and activating current members through the intentional development of personal relationships which we have been developing in NYC since February. Mobilizers were mentioned in the platforms of both the Praxis and Momentum slates, and judging from the turnout at our informal “Mobilizer Caucus” and the training module, chapters all over the country have already been thinking about doing this and are excited to pilot the program for themselves. Jessie Mannisto (Metro Washington, DC): I was one of several delegates who arrived late after a storm led to the cancellation of several flights. By the time I made it to the convention floor on Friday afternoon, my fellow delegates — and wow were there a lot of delegates — were already well into Robert’s Rules of Order. This was my second DSA convention and my second time participating in this sort of direct democracy. And it’s truly a thrill. Our votes matter, and as delegates, we all took our choices very seriously — which is why some of my favorite moments of the convention were the statements by comrades who courageously argued against some very popular resolutions. Two who stood out in my mind were Enrique Calvo, who delivered a well-researched call to remain in the Socialist International, and Maxine Phillips, who voiced concerns about the full BDS resolution, such as the need to support Israeli peace activists. As a delegate who went back and forth on these issues, I was grateful to them for standing up in front of that enormous room to share unpopular perspectives — something that is never easy to do, even among comrades who won’t hold it against you. That we have members who are willing to do so speaks to the strength of our organization. I look forward to this continuing under DSA’s big tent in locals across the country and at our future conventions. Marshall Mayer (Helena, MT): Radical democracy scales well! That was demonstrated in full measure by the 700 delegates to the Democratic Socialists of America’s (DSA) recent National Convention in Chicago. For the vast majority of delegates, this was their first DSA convention. For all of us, this was the first time American socialists conducted a truly democratic meeting of this size in decades, if ever. The result of extraordinary organizing by staff and voluntary leadership over several months, the convention managed to democratically address some very contentious issues, all in a comradely manner. By the time we all sang the Internationale at the end, we were again united around our political priorities. And we had elected the youngest and most politically diverse national leadership in DSA history. What we all do tomorrow as democratic socialists in our communities, however, is far more important than what we did as delegates last weekend. And nowhere is this more important than for the new national leadership. The National Political Committee will be challenged to keep together the various political tendencies that make up the “big tent” of DSA. Our consistent commitment to pluralism, both political and in praxis, is largely responsible for DSA’s dramatic growth since the 2015 convention, making us the largest socialist organization in America since the late-1940s. First among the NPC’s priorities should be retaining the nearly 20,000 new members who have not yet been asked to renew their membership. Rather than striving to stake the correct “left” position on any number of issues, the new NPC’s focus needs to be on building the capacity of chapters to democratically organize for independent political power in their communities, based on the diverse local priorities of working and poor people, especially women and people of color. Only with the renewed commitment of our engaged members can we double our membership, as well as the number of chapters, before the next convention (an oft-repeated goal at this convention). That is DSA’s challenge. We’ll have to do at least that, between every convention for the foreseeable future, before a mass democratic socialist movement can truly be a national and majoritarian force capable of transcending capitalism in our lifetimes. 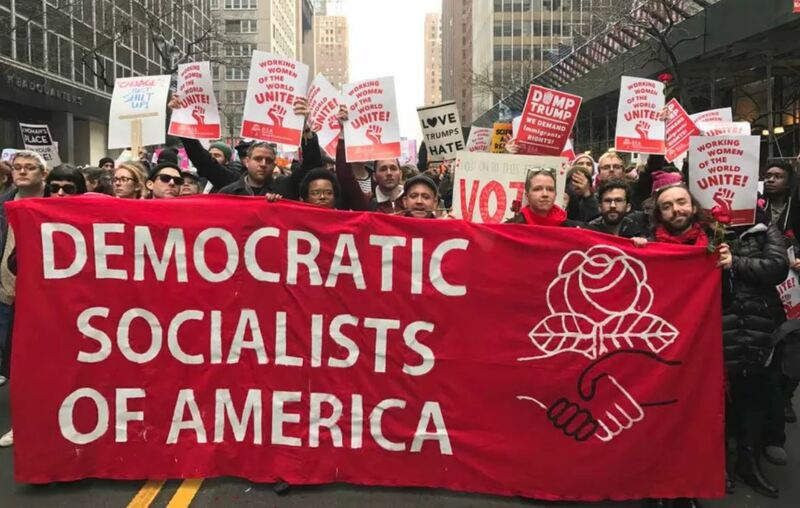 Rosa Squillacote (New York City – Young Democratic Socialists of America): The YDSA conference was held on the second day, and did not overlap with any delegate voting (although this was an accident of time and objection rather than scheduling). A new YDSA chair committee was voted in, with an explicit call to engage in developing a stronger internal infrastructure as well as building political relationships with DSA. This was mainly articulated in the Activist Agenda adopted at the conference. The question about building YDSA's relationship with DSA created some debate: some in the room felt that YDSA should develop its own priorities and political independence, others felt that YDSA should collapse into a youth caucus of DSA. YDSA was originally meant to be politically distinct from DSA, and the question now is how we should reconstitute a relationship with DSA. Two resolutions were passed, the first of which endorsed a congressional bill for free college tuition for all. This was amended to include language calling for "free and fully funded" college. The second resolution articulated in greater detail the mentorship/training program of the Activist Agenda. This was amended to indicate the mutual teaching/learning dynamic of YDSA and DSA. This amendment added the phrase "mutual mentorship" where appropriate. Two amendments were debated and passed. The first formally changed the name from YDS to YDSA. The second was a more thorough re-working of the YDSA constitution, and included changes regarding the age of elected YDSA members; city and state-wide YDSA chapters and groups, and a requirement that the annual YDSA conference not be at the same time as the DSA convention. Tina Shannon (Steel Valley DSA Organizing Committee, Pennsylvania): For me the most exciting part of the DSA Convention was the Single-Payer workshop I attended. I usually feel antsy in a workshop made entirely of presentations. This time, not so. It consisted mostly of accounts of lived organizing experience. It opened with an organizer from the East Bay Chapter in California. He gave his 7-minute rap on single-payer which was engaging and informative, even for those of us already experienced in the field. This should be recorded so we can use it. His comrades from the Bay Area gave a moving account of their organizing experiences, of how they were surprised by their first announced healthcare meeting drawing over 30 people, and then their very next one drawing a couple hundred. They teared up as they told of their folks experiencing the work as life-changing, of now having 50 team leaders and having knocked on 10,000 doors. I teared up too. Brooklyn reported a bit about the intricacy of the work in their city. I later found out that they have had so much new membership that they've had to split into 3 chapters for Brooklyn. A young woman from Texas told of being the furthest left person in her hometown and then moving to Houston. She talked about planning an event and getting a big venue and filling it. She gave details of allies who worked with them, and of one often reliable liberal who usually voted the right way but nonetheless organized a competing rally to support the ACA. Success and inspiration from the South too. The entire workshop was inspiring and informative and life-giving. Thank you to the young organizers who put it together. Christine Riddiough (Washington, DC and National Political Committee): So many people, so much energy have rarely been seen at a socialist meeting in the US. Perhaps the only event that rivals it was the Socialist Feminist conference held in Yellow Springs, Ohio in 1975. This convention achieved many things, not the least of which is the passage of DSA priorities for the next two years. Those priorities – health care, labor organizing, and electoral politics – were quickly put on the back burner when the fascist actions in Charlottesville happened so soon after. DSA members and leaders have gotten back to work fighting these latest attacks from the right. As this work continues, national leadership will develop a program to enact the priorities adopted by the convention. In doing so we have to consider this in the context of a strategy for the next 20 years. Without such a strategy, the left, of which DSA is now the central organization, will continue in the manner we have for decades – saying we aren’t big enough to have an impact on elections, on issues, on politics. It will be a self-fulfilling prophecy – we can’t do something because we’re too small and we’re too small because we can’t do anything. What does this have to do with DSA? In sixteen years, we’ll be inaugurating a President, swearing in new members of Congress and state legislatures. We need to start laying the groundwork now for a democratic socialist victory in the future. Without some vision of the future, we’ll be doing the same thing we are now – setting two-year priorities, trying to get healthcare for all, fighting the right on public education and not making any progress. 1. They should materially alter women’s lives. 2. They should give women a sense of their own power. 3. They should alter the relations of power. We have to consider our efforts in that kind of context. Political power to enact the changes we want isn’t going to come from electing Bernie Sanders or anyone else president. 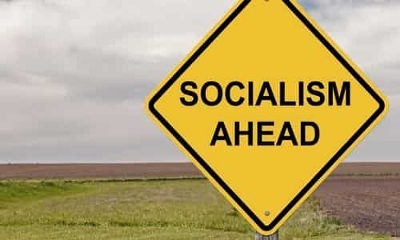 In order for the future democratic socialist president of the United States to be able to achieve anything, there must be backup – senators, members of the House, state governors and legislators who will support a democratic socialist agenda. That means that DSA will need to enter into the electoral arena. It will likely involve protests against current policies and politics, as well as proactively building a full democratic socialist agenda. And it will mean that DSA must support candidates in the local and state races where future senators and presidents are made. As DSA goes forward from the convention the work on this and the other priorities will test the organization’s strength and resilience. DSA now has the potential to build toward real power, real socialism. Simone Morgen (Columbus, OH): As a veteran of several conventions, my most salient impression in this gathering was its sheer energy and size in comparison to those I had experienced, as well as the greatly increased number of those generally considered to be millennials. The sheer number of proposals, amendments and resolutions put forth dwarfed those in past conventions. This reflects the enthusiasm of new members, many brought by the Bernie campaign/Trump election, who have no shortage of ideas. Debating and deciding on these was certainly an exercise of concentration and effort, ably handled by some of our best parliamentarians. Differences of opinion arose, as would necessarily be the case in the wide range of opinions and viewpoints in the DSA "large tent." How we can resolve these going forward, and build on the surge we have experienced is undoubtedly the key question, although given the current state of American affairs, we really have no choice but to work to craft a movement that will last. Randy Shannon (Steel Valley DSA Organizing Committee, Pennsylvania): There were a few interesting disputations towards the end. There was debate over a proposal to establish a training program. The opposition felt it was poorly conceived and unrelated to real campaigns around issues. That vote was the first to receive a hand count. The motion passed 313 to 303. The opening plenary on socialist strategy was very satisfying for me with a national campaign for single payer, a two fisted fight against the right and the neoliberals, support for union organizing in Mississippi, support for undocumented workers, and stepping up the fight against racism. It looks like the convention is 70% millennials, 40% women, and 5% people of color. There is a significant LGBTQ contingent. At this point no factionalism has reared its head. The glue is the massive DSA effort around winning Medicare for All. A workshop on single payer was standing room only with powerful stories by presenters from CA, NY, and TX. DSA locals are spearheading a grass roots mobilization for single payer across the country. Members recognize it as a "revolutionary reform" that frees an economic sector from control of capital. Here in PA, DSA is moving into this campaign. The convention passed a resolution making single payer a national campaign for DSA. An ultra-left faction tried to amend to say DSA could work with individual Democrats but not with progressive groups like Our Revolution or Progressive Democrats of America because they "support capitalism." That amendment got around 300 votes, which surprised me, but was defeated by close to 100 votes. I attended a workshop on socialist strategy. There were 40 folks from around the country. I assumed we would be talking about terrains of struggle, the major hegemonic and counter-hegemonic forces, points of weakness and strength, blah blah to move toward socialism. But the discussion was about 1) how to educate new members with an emphasis on not having to read books and 2) how to recruit members from minority sectors. My assessment is 20,000 young people joined this socialist group all at once. They held meetings and realized they were almost all "white." So their vision of strategy is fulfilling the necessity of growing into a multinational socialist organization tout suite, with little time to read books. Micah Landau (New York City): One important development has, in my view, been widely overlooked, or seen as negative: the emergence of slates for national leadership. The political differences between Momentum and Praxis - the two main slates at the convention - are important, but most important was their mere existence, a first for DSA as far as I am aware. In the small organizations to which many of us are accustomed, most members, if not all, know each other and where we each stand on the most important issues. In DSA that's no longer possible. In this context, the existence of slates - mistakenly viewed by many as divisive - made clear the political alliances that exist in the organization and allowed members to deduce candidates' political positions via these alliances. It was impossible during a single weekend to get to know all 43 candidates for leadership. Nor, I felt, did their candidate statements provide sufficient information to make an informed decision. The slates served as a sort of cheat sheet; delegates who knew and agreed with the politics of one or two members of a slate could, if they wanted, simply vote the slate (as I did). 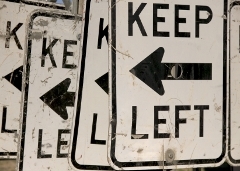 While many members - both younger members new to left organizations but also some older members who themselves know firsthand the destructive potential of factionalism - expressed wariness about the emergence of slates, they in fact represent an important step toward true political elections in the new DSA and away from elections in which many independent candidates ran without defined programs and many delegates, left with precious little time to get to know candidates, voted largely on name recognition. Slates and caucuses - which I hope both Momentum and Praxis will become - can certainly be divisive, but they don't have to be. At their best, they sharpen those political differences that need to be sharpened - and there are many of those inside DSA's new, bigger-than-ever tent - without tearing the organization apart. "Factions" will in any case always exist. Their organization into formal groups brings them out of the shadows, where they inevitably exist as informal social networks, making the entire organization more transparent and creating important avenues for members to find others who share their vision for the organization and want to organize to see it realized. Rather than fear their development or reject it as "divisive" we ought to embrace the emergence of caucuses in DSA as integral elements of a truly democratic big-tent organization. Peter Frase (Lower Hudson Valley, NY): I joined DSA in 1998, when I arrived as an undergraduate at the University of Chicago. I was already a committed Marxist, perhaps mixed with a bit of anarchism. But I took to heart the notion that “an unorganized socialist is a contradiction in terms.” So I identified DSA as the least sectarian and most politically relevant of the groups on offer; I duly walked up to their table at freshman orientation week and recruited myself. After college, I stayed involved intermittently, although nobody would have called me a particularly committed cadre. I had a sense that DSA was adrift, continuing on more by inertia than by any real sense of political purpose. And so it was, a decade or so ago, that I started to have the conversation with other comrades around my age: how do we let DSA die? That is, how do we acknowledge that this project has reached its terminus, without discarding the accumulated skill and knowledge of the comrades who do still have something to contribute to building 21st Century socialism? Yes, the name and the organizational structure continue on, but what DSA is - and who it is - has been radically transformed in a matter of months. Of the 800 delegates in Chicago, the vast majority are newcomers to the organization. At the convention banquet, the MC asked us to stand sequentially according to the period when we had become involved in DSA or its predecessors: the 1970s, the 1980s, the 1990s, the 2000s, the early 2010s, or since the beginning of 2016. Until that very last call, almost everyone was seated. And I’m proud to say that we passed this test. Our Robert’s Rules acumen had been sharpened by days of parliamentary procedure, and someone quickly realized that we had the authority to vote to overturn the chair’s ruling to clear the protesters from the hall. After that, a motion on disability language was affirmed by huge margins, order returned, and we proceeded with the agenda. That one moment isn’t sufficient to address the larger issues raised by the protesting comrades, of course. But I’m hopeful that it was a sufficient display of solidarity to avoid permanently alienating some of our most committed members. It remains to be seen whether the current burst of enthusiasm can be sustained, or if it was just a flash in the pan. But for now, at least, I’ve been convinced that the historic rebirth I’ve long dreamed of is a reality.